Instead of nictonic acid one can also use benzoic acid, but then benzene (caution!) is produced. Thoroughly comminute a mixture of 1.5 g nictonic acid and 2.5 g calcium carbonate and then using a funnel fill a test tube. Tap the tube on a hard surface so that the contents solidify. Clamp the test tube steeply to the stand, apply the plug with discharge tube, such that the discharge tube leads into a test tube, which is in a beaker with cold water. In order to avoid recoil the discharge tube should discharge a goodly distance from the bottom of the receptacle. Heat the mixture as hot as possible (with a gas burner less so! 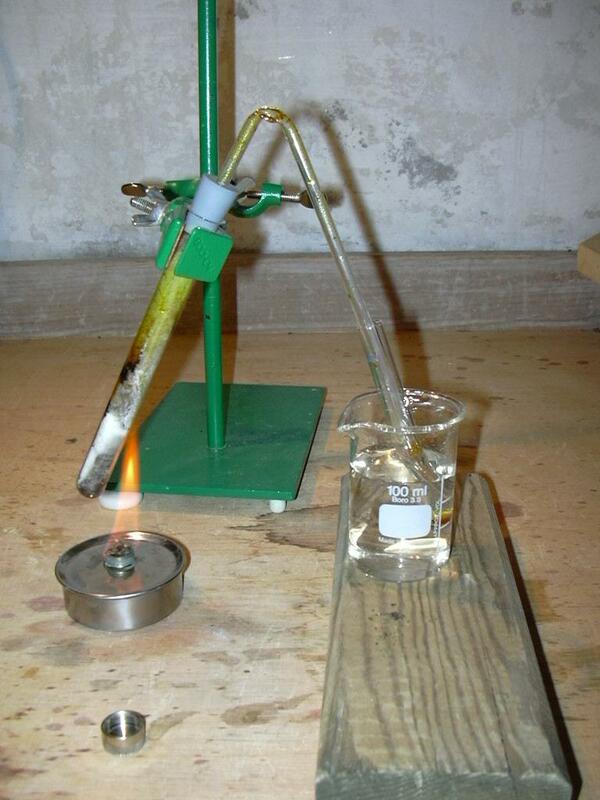 ), taking care that the top part of the test tube is also heated, otherwise the product does not distill as well. Sometimes the reaction mixture pushes itself up due to heating, in this case open the apparatus and with a rod push it down and press firmly. After a while the mixture shows carbonization, yellow smoke develops and a brownish condensate precipitates on the cooler parts of the apparatus. With time it is forced over into the receptacle. Finally one obtains about 1/3 ml raw pyridine. As soon as no more smoke develops and no more distillate can be transferred, one ends heating and carefully checks the smell of the product. The distillate should be disposed of as halogene-free organic waste. The burnt out reaction mixture can be disposed of in the household trash, one should, however, consider the unpleasant smell. The test tube in which the mixture was heated can be mechanically cleaned with either alcohol or acetone, but it is not easy to get it completely clean. From nictonic acid, as is the case with most aromatic carboxylic acids, the carboxyl group can be split off by strongly heating with lime.